Is it any wonder that true wannabe investors are disenfranchised and frustrated? And now we get a dose of one of the largest storms in history as Sandy lands with incredible fury. We pause and hope that the east coast — although in some cases will never be the same again — in others, resilience and restoration will display the best attributes of our humanity and generosity as a nation. We don’t get hit by hurricanes in Michigan. (At least not very often) But those 70 MPH winds, coming from the northeast for a period of DAYS are something quite unusual. 20-foot waves crashing into Chicago from Lake Michigan are pretty rare, too. But the prevailing winds come from the west. This storm of considerable magnitude, will pass — and so will the turbulence in stock markets and investing. The only thing that we can do is discover and prudently own the best companies. Those who do will be smiling when the prevailing winds return to their “normal” direction and amplitude. And although we don’t invest in markets (I’m eternally grateful to Ralph Acampora for talking a Detroit audience out of index fund investing back in 2000) a closer look at the primary three characteristics (think prevailing winds) for the overall market can be comforting and reinforcing. The impact of the Great Recession (2008-2009) is pretty clear. The recovery has been sluggish, “muddling through” according to John Mauldin. 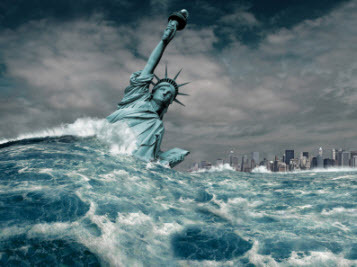 Recent forecast revisions have put considerable pressure on 2012-2013 expectations, consistent with the top-line warnings issued by Barry “The Big Picture” Ritholtz and Joshua “Reformed Broker” Brown. 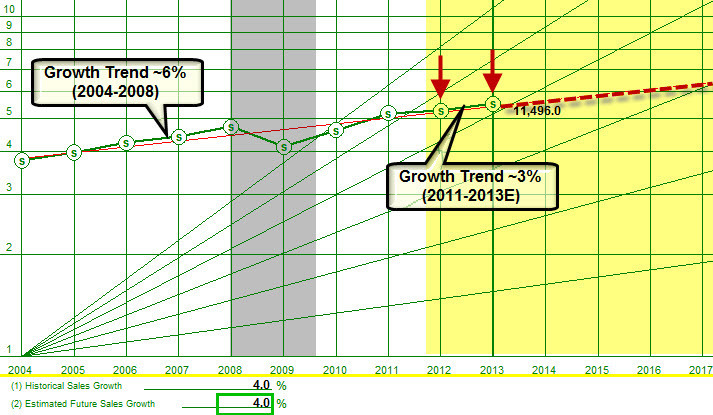 One way to look at a “New Normal” is to observe the ~6% growth pattern pre-2008 and contrast it with the 2011 (and beyond) pattern that seems to more closely resemble ~3%. Once again, the impact of the 2001 and 2008-2009 recession is clear. 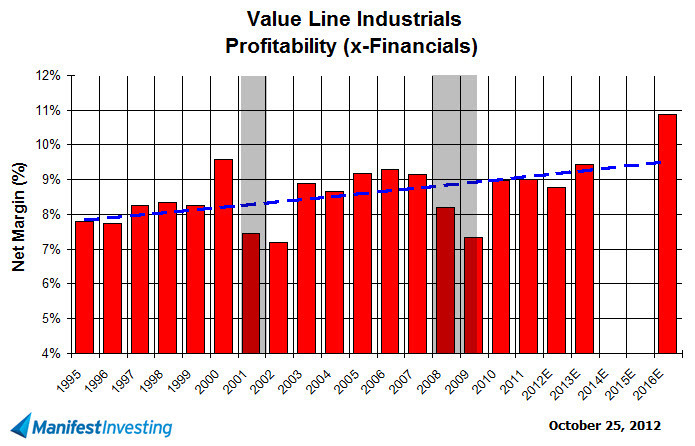 Profitability gets hammered. It’s also clear why this recovery “feels like a recession.” Look at the weak recovery during 2010-2012 and note that 2012E is now below that long-term trend (productivity renaissance) and the 2013E forecasts are steadily weakening. 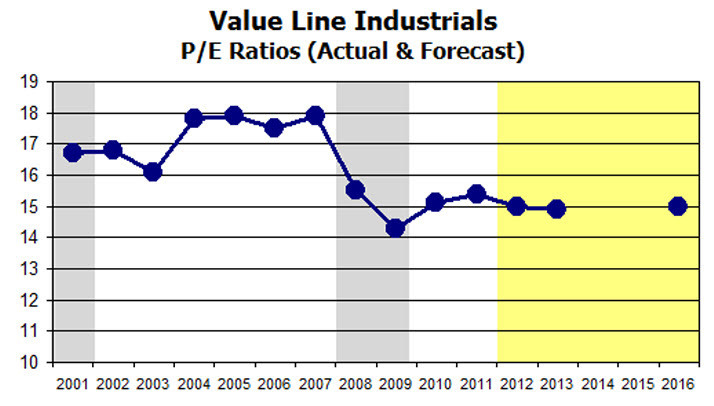 We have seen the typical/traditional erosion of profitability expectations for 2012 as the year winds down. But check out the 2013E forecast. Keep in mind that forecasts for 2013E and 2014E are typically pretty exuberant right about now — year-in and year-out. Squint all that you want. You won’t see a whole lot of exuberance in the 2013E forecast and keep in mind that this is eroding as rhinos update their analyses going forward. We’ll continue to watch and hope that somebody stems the erosion tide. This is actually something of a bright spot. Previous collective P/E forecasts for 2012E and 2013E were actually lower — and have improved in recent months. Note that the P/E forecasts dove tail with the ebb of the sales growth trend and that “New Normal” conditions for the foreseeable include lower P/E expectations for the collective. Our thoughts and prayers go out to those in Sandy’s wake — and we look to better days ahead … and prevailing winds, in the right direction. We want you to experience better results. Period. I’ve witnessed time-honored success in investing that spans several decades. That success has been realized by individual investors and groups of investors (partnerships known as investment clubs.) Success can be defined many ways. For our purposes, we regard success as achieving superior returns. “… in 44 years of Wall Street experience and study, I have never seen dependable calculations made about common stock values, or related investment policies, that went beyond simple arithmetic or the most elementary algebra. Whenever calculus is brought in, or higher algebra, you could take it as a warning signal … of substituting theory for experience … or to give speculation the deceptive guise of investment.” — Ben Graham. In our work with successful investors, we’ve seen what works. It’s a harsh reality that STOCK PRICES FLUCTUATE. These fluctuations often produce a calamitous combination of frustration, fear, confusion and frankly — drives most would-be investors crazy. The result commonly produces ostriches and in a nutshell, fosters conditions where people avoid life-changing potential of discovering and OWNING the best companies at the best prices. “Investing is most intelligent when it is most businesslike … DISCIPLINED [and PATIENT] … and superior results are possible.” — Benjamin Graham, George Nicholson Jr., David L. Babson, Kenneth Janke, Warren Buffett, Thomas O’Hara, et al. Chaos is not a reluctant investor’s best friend. But the reliable extremes achieved by momentum-driven pendulums can be one of the best friends to a patient, committed and disciplined long-term investor. We created Manifest Investing to generate and maintain FOCUS on the things that really matter — focused specifically on the most important factors that have led to decades of superior investing results. Lessons learned over decades still apply. Superior results are possible. Rinse. Repeat.